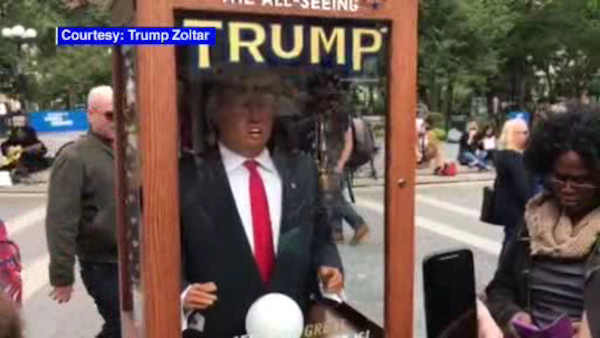 NEW YORK (WABC) -- In yet another example of the most bizarre presidential campaign in U.S. history, the Donald Trump 'Zoltar" machine has popped up in several places across New York City. Made famous in the movie 'Big', the fortune-telling machine has been drawing large crowds, including people in Union Square on Thursday. The artists want to remain anonymous about their identities, but not about about their politics, saying "it's about Trump and how dangerous he is for this country." The 'Trump' in the machine is heard saying, ""In the future when I'm president, I get to choose my cabinet members. Now this is a very important role of the president." THe artists worked with a group of collaborators and said it took them about four months of work to complete the machine.